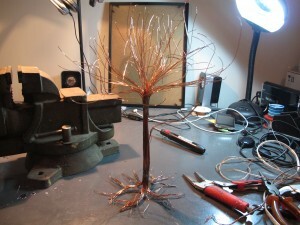 For Mothers Day this year I made an ornamental tree from copper wire. 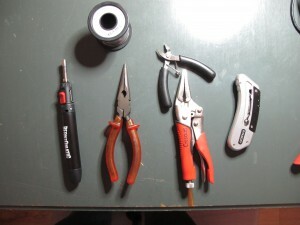 This post documents the steps that I took to build it. 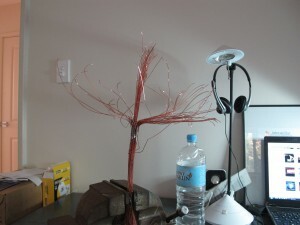 In the above photos extra copper cabling was shown to make thinner branches if required. These extras were not used in the final product. The plastic insulation surrounding the mains cabling needs to be removed. 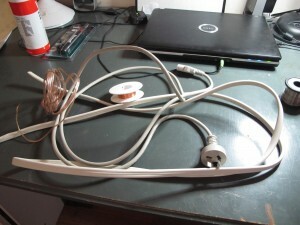 The method that worked the best for me was to hold the cable taught and slice down it with the knife. 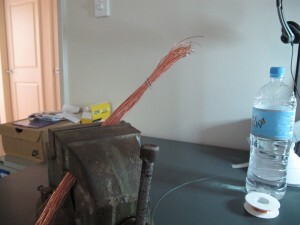 This was then repeated for the individual cores within the cable. 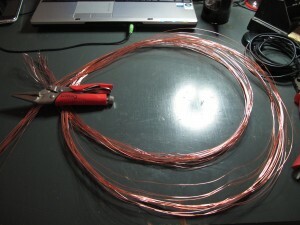 After stripping the cable, the wire was cut into thirds (~66cm) and then bound using a piece of wire, resembling the trunk of the tree. Length was left to form roots that would support the tree once finished. Not all of the wire was used for the trunk, approximately a third was kept aside to fill out the branches at a later stage if needed. 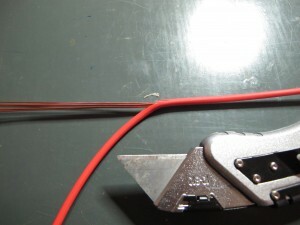 After clamping the binded wire in a vice, making sure that the trunk had a circular shape, a butane torch was used to heat the wires and solder was applied to bind the trunk together. The solder could not be directly applied where the torch flame was, as it would melt before reaching the copper. The wire bunch was heated momentarily and then the torch was moved further around the trunk. The solder was then applied to the hot trunk. This process was then repeated approximately half way up the trunk to set the position for branch formation. Enough solder should be applied so that the entire trunk is stuck together. If your applying solder to one point and it is running out of another its a good indication that the solder has progressed through the whole trunk. Excess blobs of solder can be cleaned up by applying the torch to them and then dragging it to where more solder is needed. 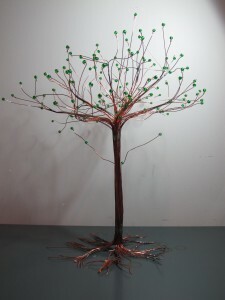 I had a fairly good idea of how I wanted the tree to look, however if inspiration is needed when making a similar design, look at a real tree or if you really have to, search for photos of one. 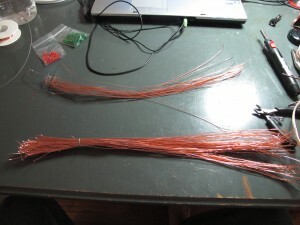 The above photo shows the rough branch formation that I made by recursively separating bunches of wire. A similar method was used for making the roots, but with less separation. 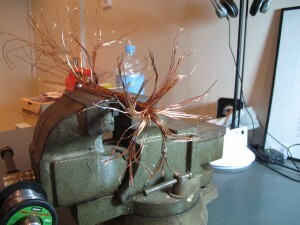 The clumps were then bound with wire and soldered together in the same method used to make the trunk. 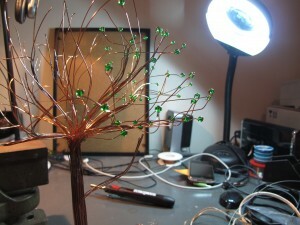 Branches were then bound and soldered. Once the branches were fixed in place and the tree could stand by itself, green glass beads were added to the branch wires. In total 144 beads were used. 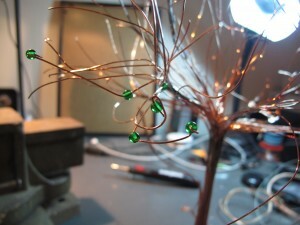 While wire was kept aside for extra branches and finer ones, it was not used in the finished product. The finer wire would have distorted under the weight of the glass beads. As an aside, the tree was a hit Mother’s Day present and unexpected. This entry was posted on May 9, 2010, 9:29 pm and is filed under Make. You can follow any responses to this entry through RSS 2.0. You can leave a response, or trackback from your own site.